An awesome blog written by Señora Hitz. 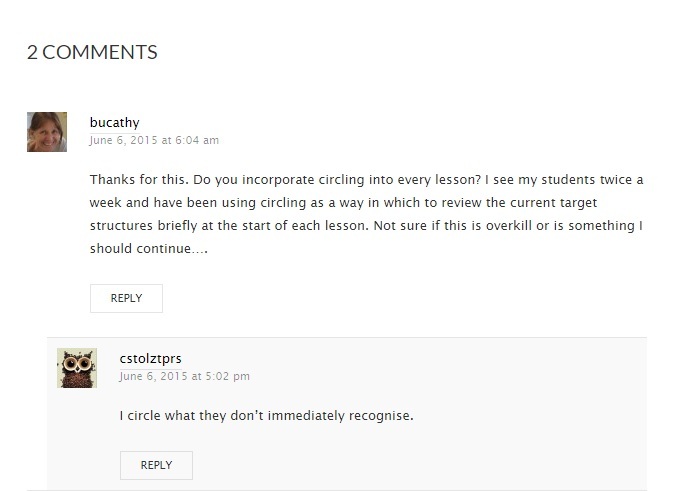 The blog includes many awesome suggestions and those I believe are appropriate for Aussie teachers can be found on my TCI activities pages found on the home page in the top right hand corner. Posts like this, for me, help me to stop and reflect upon an important aspect of TCI/TPRS teaching. They help me to remember and appreciate what second language acquisition is truly like for my students. I hope it helps you too not only with understanding SLOW but also the many facets of SLOW. Read and contemplate the truths of ‘Haste a Not Waste’. 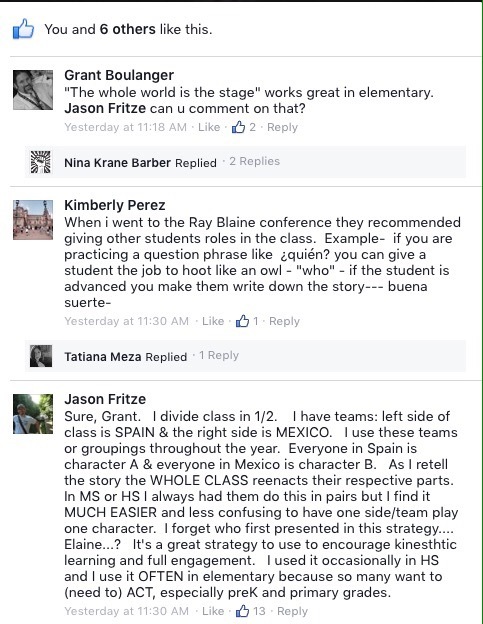 A great thread appeared overnight on the iFLT/NTPRS/CI Teaching Facebook page Have you joined yet? If not, I highly recommend it. It is a global community totally dedicated to all levels and aspects of TCI. Your own personal PLC where you can comment on other posts or ask questions about teaching with Comprehensible Input and TPRS. For those of us here in Australia, where TCI is only just taking off, this group is awesome. Whether you prefer to be a lurker or a contributor makes no difference because the other teachers here bring a wide variety of experiences and the knowledge they share is impressive. They too cover the spectrum of experience and once you take the first step and. join, you will discover what a warm and generous community it is. My only word of caution though is: go with your gut feeling. Remember that we Australians aren’t the only ones frustrated by the lack of training available here and thus interpretations of TCI vary. If a suggestion sounds a little off centre, don’t worry or stress; it is most likely because of a different understanding of what TCI actually is. If you need clarification, ask openly on the page and no doubt an experienced practioner will chime in and clarify. There are certain names to look out for and you’ll recognise them from all your readings. 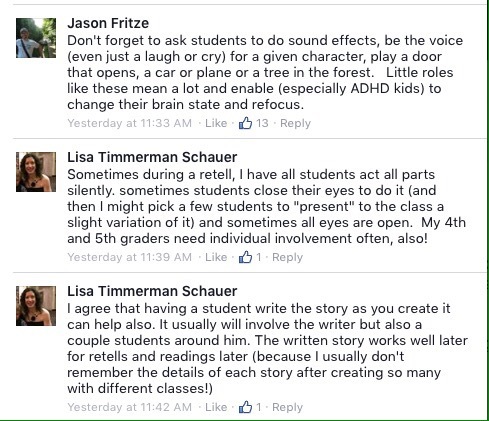 The thread I enjoyed reading this morning asked how to involve more students when reviewing a story. It was posted by a parent/teacher who has a child in one of her classes. I remember the pros and cons of teaching my own children and this was definitely one of the pros. I totally appreciated the insights into both my teaching and the students in the classes. The answers to the question were awesome and most of them are worth sharing becausse they would work very well in our primary classrooms. Interestingly though, is that secondary teachers have also shared here! 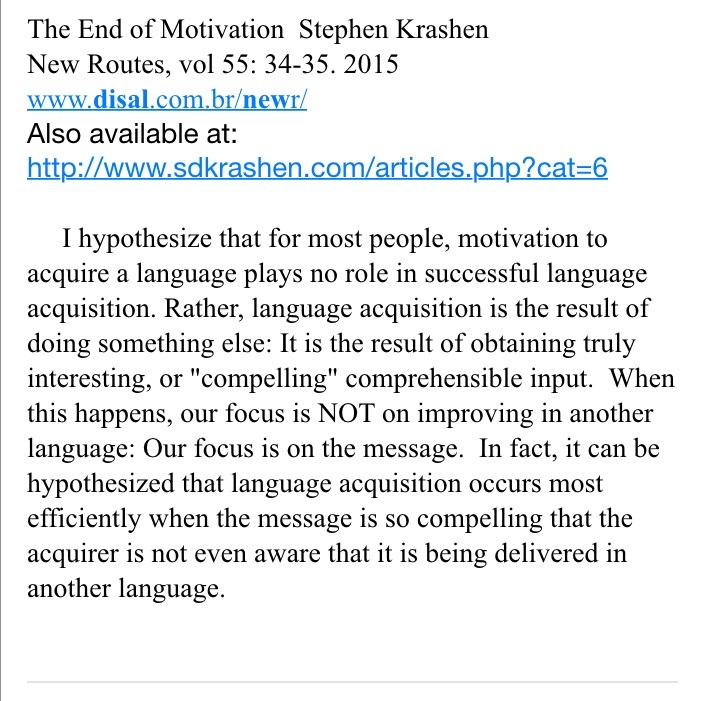 The answer below by Karen Rowan actually fits in after Grants initial comment above. 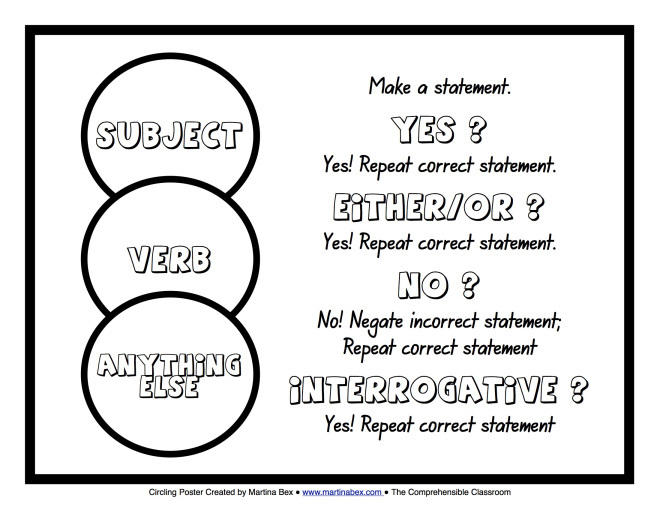 So many great ideas here to not only gets heaps of repetitions but also to keep our students engaged in the story. Week 2 is always a disappointing week for me. Students are usually amazing in week 1 when they are so thrilled and excited to be back at school which is always delightful. However I then plan lesson plans for those enthusiastic students only to discover that by week 2 they did a ‘Jekyl and Hyde’ over the weekend and my lessons do not turn out quite the way I had envisaged. Week 3, thus is a great week by comparison! I am prepared, in fact usually over prepared, but at least this time it is strategic over planning unlike week 2 where it was head in the clouds over planning. I can’t believe I tried to do a movie talk last week with the combined year 6/7 left overs that focused on entirely unfamiliar structures! What was I thinking?? Not surprisingly it was a huge flop. Still, I learned a huge lesson from it – doesn’t matter how engaging the video is, if it’s not comprehensible, it will not be engaging. This week with another group of year 6/7 left overs, I showed Laskar Pelangi which was far more successful for several reasons. Firstly, it was purely an English culture break and considering the film went for 3 lessons and students were engrossed right up to the end, I was happy with that. I also have to confess that it was my first time watching the movie so maybe in future years I may consider using it as a MT now that I can see the potential. The lessons progressed well in that we began with a single lesson and then 2 days later had a double. I said very little before the movie started yet before continuing with the movie in the double lesson, I talked about several aspects including a little Belitong history and providing a bit more information about the main characters. 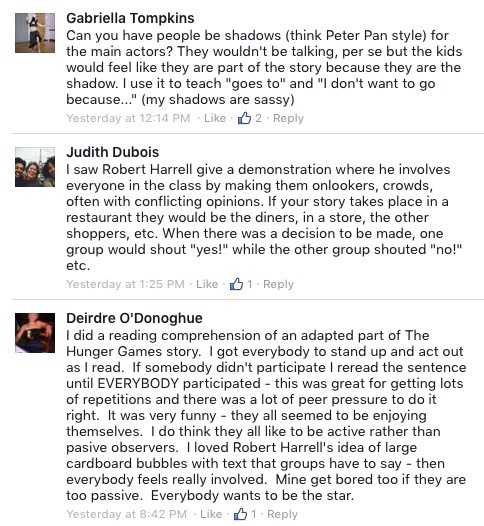 Yet it was the discussion about the symbolism that students enjoyed the most and then commented on during the movie. I spoke about the symbolism of fences (dividing communities), crocodiles (obstructions) and rainbows (happiness, togetherness and positive hopes for the future). This term with the other classes (ie all but the year 6/7’s), we are looking at the kancil & Buaya story. At the end of term 3, our hub group met and we simplified the story to ensure the story only incorporated a few unfamiliar structures as well as revised many of our known structures. 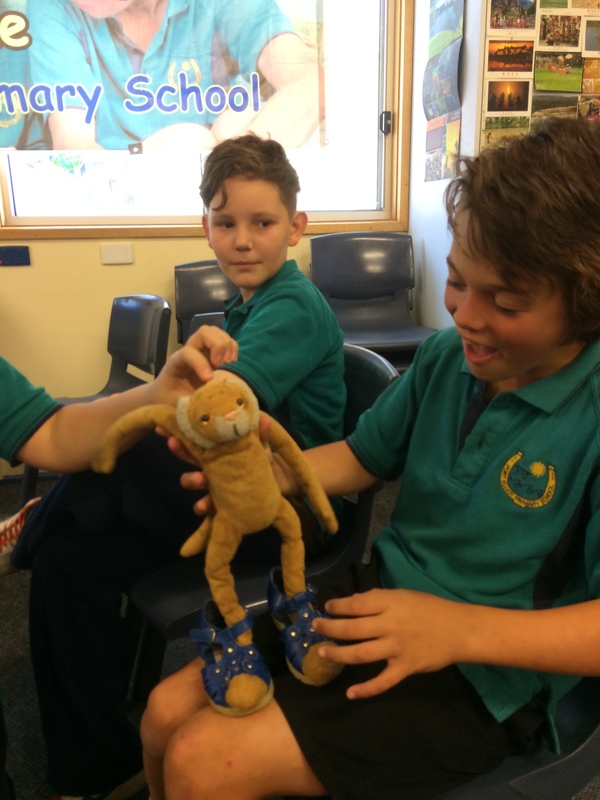 Last week I introduced the word ‘kancil’ and largely in English we talked about their body shape, their diet and where they are found globally. Naturally it was only their diet that lent itself to circling! Kancil makan apa? 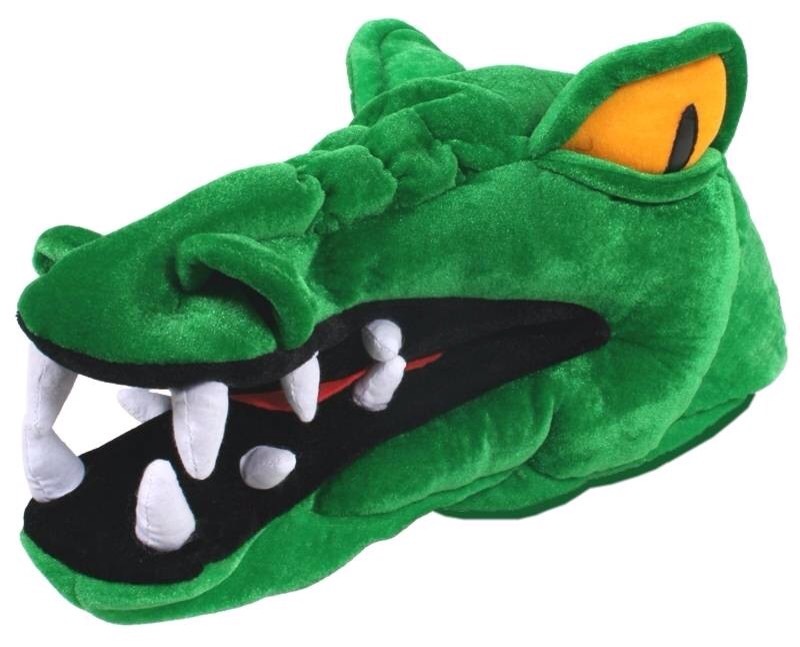 This week I introduced the word ‘buaya’ using both a picture of a buaya, a soft teddy buaya and a hilarious crocodile hat I found at Savers last Sunday. As usual, using Annie’s voices, I introduced the word encouraging the students to repeat buaya over and over in a variety of ways including singing, syllablising, weird voices and generally having fun. I then held up the buaya soft teddy and circled buaya. 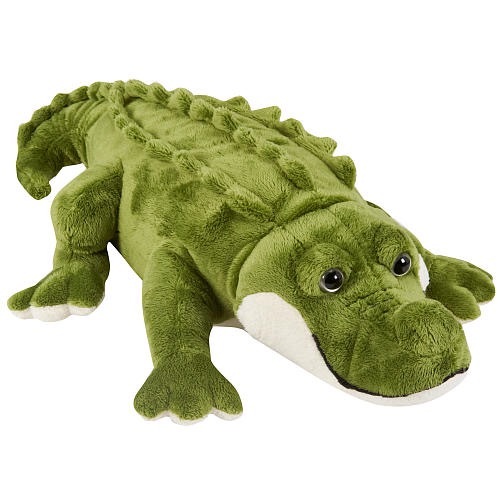 I then opened a bag of soft teddy animals including the crocodile hat. I held the buaya soft teddy in one hand and with the other dug into the bag. I pulled out random animals and asked, ‘Buaya?’ The students loved the suspense of not knowing what was coming out of the bag and all screamed with delight when I finally pulled out the crocodile hat! The hat is great because of its large mouth and which allowed me to revise makan. Buaya makan sepatu? I walked around amongst the students stating sentences like that and then having the crocodile mouth the shoe. Or I would point at my nose and say a couple of times ‘hidung’ before saying buaya mau makan hidung Joey. They just loved it and were all begging to be eaten!! It was chaotic and loud with lots of laughing. I actually had a parent looking for their child, knock and put their head in the door while I was bent over a student ‘makan sepatu’ and I’d love to know what she made of what she saw! Hopefully she asks her son! It was strange though because I felt guilty that I was having too much fun! That I should have been more serious! Oh well…. I did a ‘kindergarten reading’ with the story with the year 4’s where I had them sitting on the floor in front of me and I read a big book version with large colourful pictures. They were totally engrossed yet when I asked afterwards whether they preferred acting out the story or listening to it, the majority said they much preferred acting it out!! Didn’t see that coming. This story incorporates the numbers 1 – 10 which has been a great. Early in the week I suddenly remembered a counting song from Languages Online. Unfortunately it goes way too quickly for my younger classes, but then I had a brain wave! Instead of singing satu, dua, tiga bunga (not a familiar word), I changed it to satu, dua, tiga buaya!! Then I got even more creative and sang about kancils, penguins, orangutans and finished with murid murid! The more repetitions I can get with this song the better to cement number acquisition. Can you pick the tune? Lifted from cicak cicak di dinding! Hope you had a great week too. What a day it was yesterday! I was incredibly nervous, because I was going to be observed by an Indonesian teacher colleague who was curious to see TCI in action after attending the TCI workshop we’d run at the Intan conference earlier this month. At this stage, I was expecting them to suggest verbs from the word wall. Yet with circumlocution, one of the students pointed out (in Indonesian) that if Lesley couldn’t eat or drink, then Lesley also wouldn’t be able to pooh. The class was all in agreement. I was torn! Was I asking the story or was I telling the story? I then remembered a fellow TCI junior primary teacher saying that the most popular story topics that hook JP students are blood, teeth & selfies. As this was student led, and the word they wanted was a word that, one could argue, could be very useful when traveling in Indonesia, I gave the word a parent would use with their toddler – eh eh (each pronounced ‘e’ as in egg). It immediately became the word of the day and became very difficult to complete the story! It wasn’t till the next lesson that I was able to guide them to finally agreeing on an ending to their story which included a little more than just ‘eh-eh’. I had great difficulty keeping them inbounds – they were determined that there was a blockage – and unfortunately this meant the story contained a lot of totally unfamiliar vocabulary; yet the students were thrilled with the end result. ….dan Lesely tidak bisa eh-eh. Ada satu lagi orang. Nama orang Jeza Besar. Jeza Besar punya tiga kepala. Jeza Besar bisa makan tiga es krim. Jeza Besarkasih Lesley dua kepala. Tenggorok Lesley tertutup dengan eh-eh. Lesley mau minum kopi es. Lesley berkata, Saya mau minum.” Lesley makan kepala kedua. Tenggorok Lesley tidak tertutup lagi. Ada perempuan. Nama perempuan Barbie dan Barbie tidak punya kaki. Kasihan Barbie. Barbie tidak bisa berjalan kaki. Barbie bisa minum. Barbie bisa makan pizza. Barbie bisa menyanyi. Barbie tidak bisa berlari tetapi Barbie bisa bermain bola basket dan Barbie bisa merayap. Barbie bisa bermain golf. Ada laki laki. Nama laki laki Jonah. Barbie tidak punya kaki dan Jonah punya empat kaki. Jonah bisa berjalan kaki. Jonah bisa berlari. Jonah bisa merayap. Jonah baik hati. Jonah kasih Barbie dua kaki. Barbie bisa berjalan kaki. Barbie bisa berlari dan Barbie bisa merayap. Translation: There’s a girl named barbie and Barbie doesn’t have any legs. Poor Barbie. Barbie can’t walk. Barbie can drink. Barbie can eat pizza. Barbie can sing. Barbie can’t run but Barbie can play basket ball and Barbie can crawl. Barbie can play golf. There’s a boy named Jonah. Barbie doesn’t have legs and Jonah has 4 legs. Jonah can walk. Jonah can run. Jonah can crawl. Jonah is kind hearted. Jonah gave Barbie two legs. Barbie can walk. Barbie can run and Barbie can crawl. Beforehand, we had organised some props: a wheelchair, a sarong to cover Barbie’s legs and a pair of stuffed stockings. The story progressed beautifully. As usual, I had no trouble sourcing volunteers for the actors. 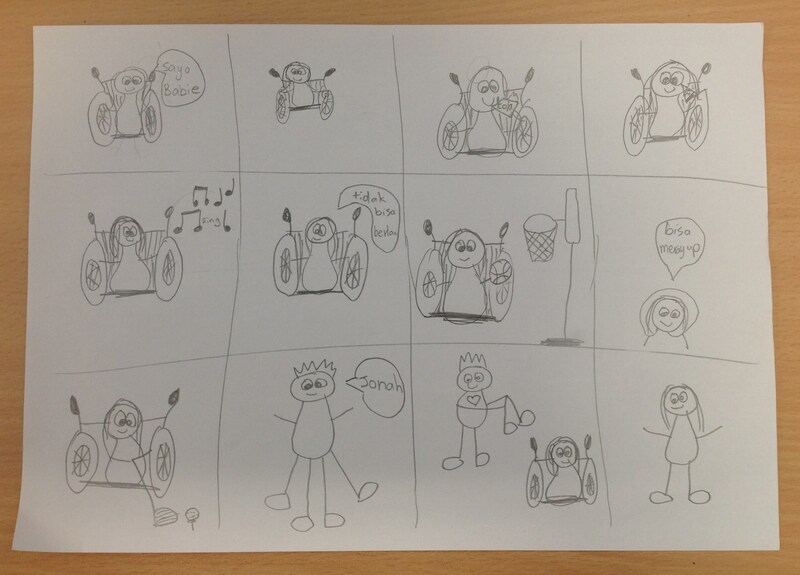 Firstly Cooper was Barbie and he happily sat in the wheelchair with a sarong covering his legs. He acted his part beautifully. Beth (not her real name) then jumped at the chance to be the second actor. Her face dropped slightly when I brought out the stuffed stockings, yet she bravely continued and helped tie them around her waist. The girls were madly gesturing to her to pull the ‘legs’ to the side so they didn’t hang in front of her legs. The boys meanwhile, were in hysterics. Beth was such a good sport; she continued to act out her part even though she realized that the whole class (and teachers) were laughing so hard, we all had tears in our eyes. 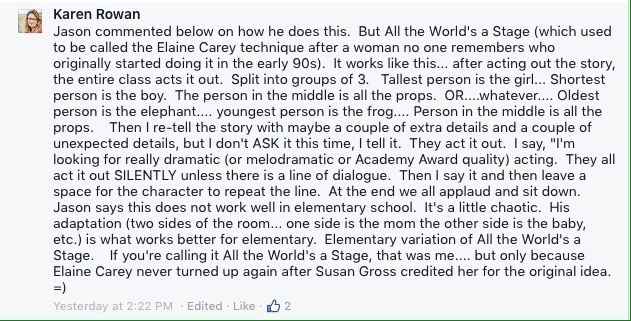 With 2 long shapes swinging around her legs, she walked and ran back & forth on the narrow catwalk through the audience, but it was the demonstration of the crawling that undid the audience. There is no way I can describe it to you and do it justice. I was just so happy I had 2 other adults in the room who can verify just how funny this acting of this story turned out!! After the 6/7 lesson, the day continued well with all classes beautifully demonstrating why I love TCI. Students gestured whenever I said something they didn’t understand (& also when they did understand because they enjoy the attention they get for gesturing! ), students of all ages asked, “Boleh saya Bahasa Indonesia?” if they wanted to say something that was beyond their level of Indonesian and in particular, that all classes can now respectfully greet visitors in Indonesian. I was on such a high afterwards. 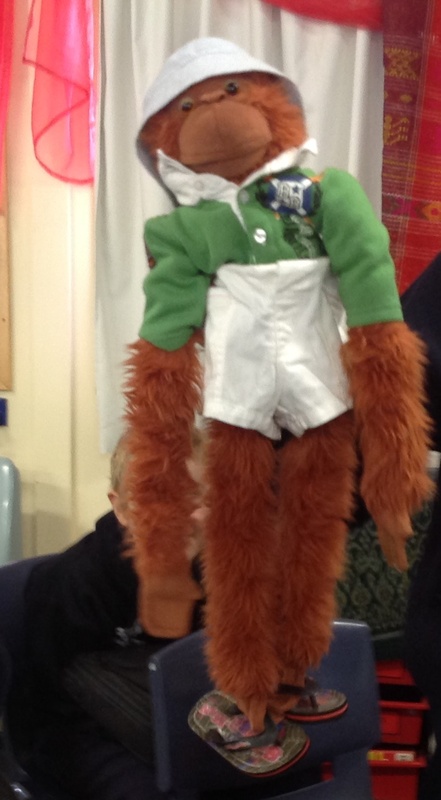 It was brilliant that the lessons had all gone smoothly and also that Kay was so impressed with what she’d observed. Her feedback was generous and very encouraging. Yet, I do wonder just how my interpretation of TCI compares with officially trained TCI teachers in the USA. I hope I’m not too far off the mark and until I can attend one of the conferences, I console myself with the famous TPRS quote; “Bad TPRS is better than no TPRS”!! The names of the 2 central characters are flexible and when I first told the story last week to classes I chose names of students who were prepared to act out the story and for whom the props would fit according to the story! 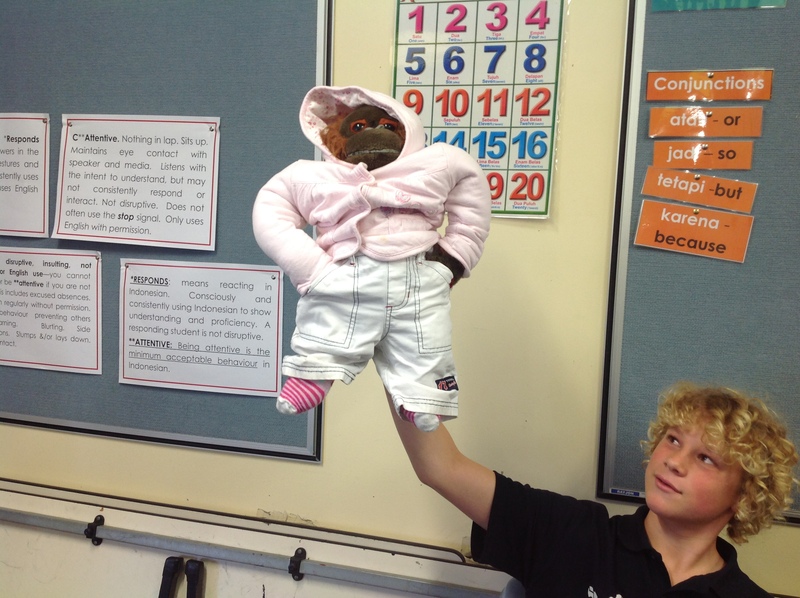 Naturally this didn’t always go to plan, but mostly the students pretended and went along with the story!! In the first weeks of term, I introduced the structures terlalu besar, terlalu kecil and pas, trialing the concept of visual PQA which I read about on Ben Slavic’s website. See this post for more information. I continue to refer to and add to the notebook file as I go along. It truly has been an engaging technique for introducing and/or reviewing structures. After I was reasonably confident students had acquired the above structures, I then introduced the cognate, jaket and the verb ‘pakai’. As I also want students to be aware of the vocabulary for other forms of clothing preparation for their freewrite next week, I chose ‘topi’ as in term 4 when we have a compulsory hat wearing policy and ‘sepatu’ because with winter almost here, I need to prepare for the seasonal after recess & lunch JP student requests to remove muddy shoes! and established gestures that represented each. I have now incorporated a TPR session into all my lessons to both reinforce and review the gestures we have established so far. As Catharina has found with her students, Simon says (Bu Cathy berkata in my case) is one of their favourite games and once students become complacent, Catharina recommends ramping it up by saying one thing and doing the gesture of another. My students ABSOLUTELY love it too!! Go figure! 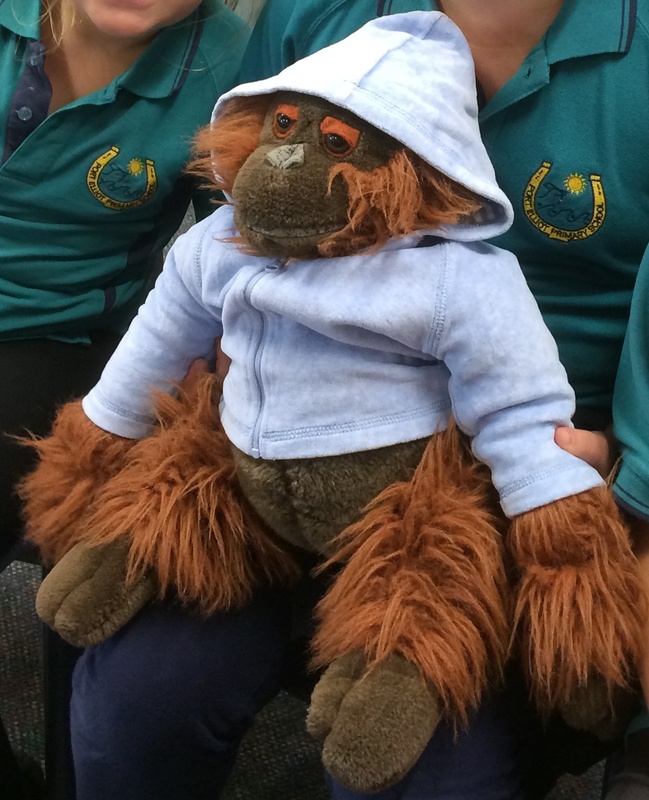 A fun activity I did was put together a collection of soft teddies, monkeys and orangutans as well as a pile of baby clothes. 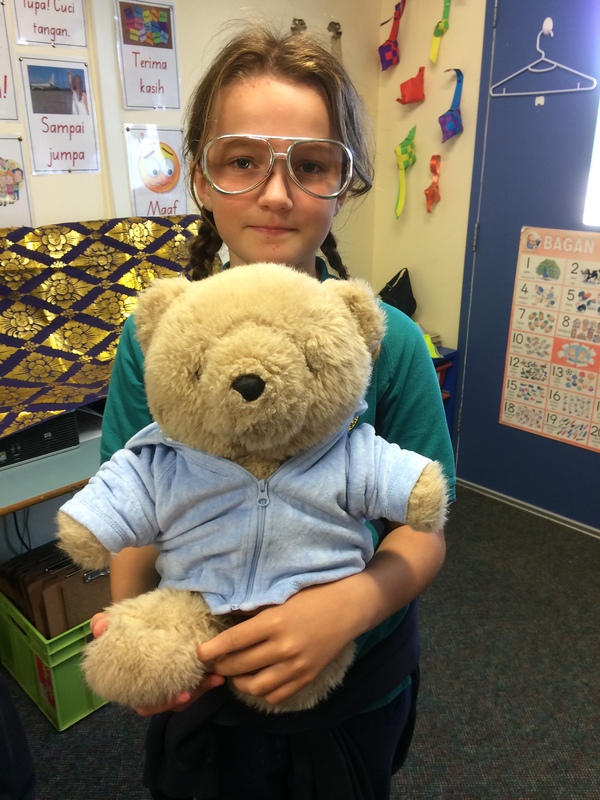 In small groups, students had to dress a teddy and then come to a consensus about whether the clothing was terlalu besar, terlalu kecil or pas. It was hilarious and students from all year levels had a ball. While there was a lot of English in the overall dressing of the teddies, the discussion about the clothing was 100% in Indonesian which was awesome. I also had a ‘tukang foto’ who took photos of groups once they had all agreed on the clothing size/fit. If we had time, I asked groups to show us their teddies and then tell us all what was terlalu besar, terlalu kecil atau pas. Some groups incorporated the vocabulary of other forms of clothing using the posters I had up on the white board but the main aim was to get repetitions on the target structures. The following lesson, I put up some of the following photos taken by the tukang foto on the smartboard to provide an opportunity to combine the reps of all target structures while circling. Noisy Pictionary – 2 teams – Everybody is in one of the teams and everybody participates. One artist from each team comes to the board. Show them a sentence from the story. They then run to the whiteboard and draw the phrase for their team mates who scream out the sentence it is. Point to the team who first match the sentence with the illustration. (While this sounds a great game – I am wondering if it might be easier to manage if each group takes it in turns and they are timed. I also like the idea of drawing it on the smartboard so that I can save a digital copy of the illustrations!) Source: Bryce Hedstrom.